Note: At this time we can ship only to North America -the United States, Canada, and Mexico. I know many of you wish you could set up your router bits perfectly every time. Well, this little jig does it perfectly every time, and I don’t even have to remember the setting for each cabinetmaking bit! Each leg is labeled with the router bit(s) that you use most frequently! But if you wish to have a custom setup, you can do that, too – I recommend you record somewhere what setting you selected, and you will repeatably be able to do it again any time in the future. Pretty cool! 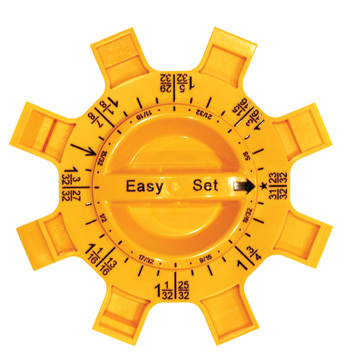 To read all the details about the Easy Set, go to the Sommerfeld Catalog, Page 51. I have been using this jig for quite a while now; I bought mine at the Kansas City Woodworking Show 3 years ago, and have been using it since. I have worn the edges a little with the carbide cutters, but it is still perfectly functional. To enter this month’s drawing, all you need to do is send me an e-mail message to sandal_woods@bbwi.net; please include your full name and full address. If you have registered for previous drawings there is NO need to re-register.